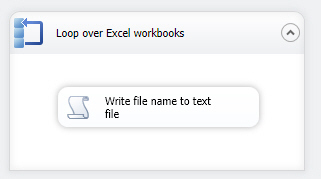 Create a new, empty text file in some folder called Excel workbooks.txt. 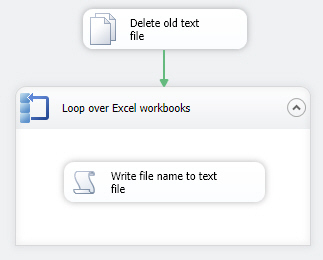 The aim of this exercise is to add one row to this file for each Excel workbook on your USB disk. To start, create a package called List workbooks. If you're looping over files, you need to hold the name of each in a variable. You could run this package, but it wouldn't do anything very exciting yet! Add a script task, and pass the WorkbookName variable to it. If you want to know more about how this works, please do ask your trainer. Your list will have more files in than this, and the folder paths will be different. You'll need a file connection manager to to get this to work.